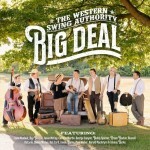 From Canada, The Western Swing Authority is back with their fifth album called “Big Deal,” and they serve up healthy portions of western and jazz influences to satisfy even the biggest appetite. The seven band members feature vocals, twin fiddles, guitar, steel guitar, bass and drums. For this project, every cut also offers one or more special guests. We hear Jane Monheit (“Mississippi”), Ray Benson (“Dance With Who Brung Ya”), Jason McCoy (“ExtraOrdinary”), Carolyn Martin (“In The Middle of the Song”), George Canyon (“Big Ball’s In Cowtown”), Buddy Spicher (”Big Deal”), Russell DeCarle (“After The Leavin’”), Bruce Bouton, Danny Michel, Rob Carli, Jason Blaine, Paul Weber, Harold MacIntyre and Johnny Burke.